The following interview with the artist and review relates to the exhibition Animation to Murmuration in 2013. It is reproduced here with the permission of Draíocht Arts & Entertainment Centre in Dublin where the exhibition took place. As a boy, I had no clear ideas about a career path, but being in the countryside I developed a keen interest in all aspects of natural history in the local area. I joined in the usual ‘boyish’ activities of catching pinkeens, stealing honey from wild bee nests/hives and making catapults and sling shots to hunt rabbits and other animals and birds which were often referred to as vermin. Nonetheless, through these activities I was often very close to nature and therefore able to observe animals behave in their natural surroundings. These field excursions, usually at dawn, around the local fields were most rewarding and sparked a life long interest in animal behaviour. Gradually I realized the errors of my ‘hunter gatherer’ behaviour and replaced the urges to capture and collect specimens with field observations and communications with the local wildlife. After listening to and learning the calls of birds and animals, I was able to ply my skills in imitating and ‘calling in’ some birds and animals in the area. I had most success and fun each spring with the cuckoo. During the mid-seventies I embarked on a two year course of intensive studies (evenings) at the National College of Art in Kildare. After this I joined the Graphic Studio Dublin to study all aspects of Printmaking. In 1980 I got married to Brid Laffan from Co. Kilkenny. At that time we both agreed that we would combine incomes and from then on I would devote myself to full time art. Brid was an avid enthusiast and supporter of the arts, particularly literature, music and painting. She was a talented singer and was a founding member of the RTE Philharmonic Choir. My artistic endeavors always had her wholehearted support in good times and bad, even when she didn’t particularly appreciate some of the themes and variations in the work. Sadly, Brid passed away in April 2006. My earliest memory of a ‘First Art Work’ was a watercolour, copied from a book on birds of prey. It was a small falcon called a Hobby -This was painted when I was age 15 or so when I had begun a life long fascination with birds of prey. This was followed by a very ambitious painting in oils, an exact? copy of Constable’s ‘The Haywain’. It was a very fine fake, if I may say so! Yes, my style has changed a great deal over the years from the early watercolours already referred to, to the more recent abstract impressions of bird flocks (murmuration series) to the works based on photography and animated video images – works on plastic – based in the cut away bogs in the midlands. (See First Floor Gallery in Draiocht). It is always difficult to navigate through a ‘bad day’ given that such days usually arrive out of the blue and totally unannounced. My own strategy is to step back from the problem and try to regroup. This can best be achieved by maybe taking a break, making a cuppa and contemplating the problem. A kind of staring at the proverbial canvas. It is often a good idea to take a walk around the block, get some fresh air which can be good therapy for relieving any mental blockages and refocusing on the task at hand. Handling the business side of being an artist is usually the ‘Beecher’s Brook’ for many colleagues I talk to. We just want to put our heads in the sand and get on with creativity. Having an friendly advisor/support system with a good listening ear is very worthwhile. Ideally, this can be your supportive partner/spouse/friend or family member. For me it is essential to have an accountant who will take care of the annual headache of making returns. This helps to free up your ‘head space’ and allows you to get on with your work. Also, join an arts organisation such as Visual Arts Ireland who offer a wide variety of support systems and programmes geared specifically to the requirements of being an Artist. Keep a keen eye on Gallery Open Call Notices and similar opportunities from Arts associations and the like. Get going by submitting to open competitions, group shows both local and international. Remember the motto’ the people who show up run the world’. This current exhibition is based on an ongoing project based on the minimalist pattern of birds in flight. The aim is to catch the ‘brushstroke’ patters of flight in a minimalistic way. This imagery was colourfully described by the poet Brendan Kennelly who likened such spontaneous murmurations to ‘a fistful of black dust flung in the air’. The other dimension to this show is a result of experiments using a mixture of synthetic materials which are painted on and manipulated by sunlight and landscape as backdrop, then photographed in order to create distortions and illusions in the subject matter. This work was undertaken over the past three years or so. The main object of an artist starting out is to believe in what you are doing and be motivated and enthusiastic about your subject. Keep an open mind any don’t be afraid to ask questions, share ideas and experiment with different ways of expressing yourself. This process should lead you down the path of identifying and ‘finding your voice’. Once you are fired up and committed to what you want to achieve, then believe in it and forge ahead. In other words, having found your voice you now have to be heard, so perform, ‘sing up’ and put it out in the public domain. Desmond Kenny is an artist based in Hartstown, Dublin 15. He is a self taught painter, since he began making art in 1986 he has since exhibited widely in Ireland and abroad, solo shows include Draíocht in 2001, The Lab in 2006 and Pallas Contemporary Projects in 2008. 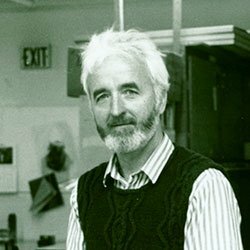 His work is included in many collections including the Office of Public Works, SIPTU, and Fingal County Council. Kenny’s practice also incorporates print making and he has been a member of Graphic Studio Dublin since 2004.